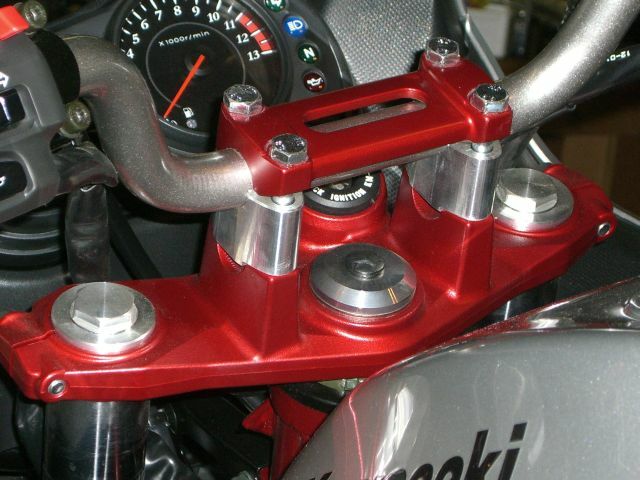 Advanced Motorcycle Products has two types of bar risers that will fit the Ninja 650R series of bikes. The bar risers that fit the Ninja 650R are the zero offset type that provide 1.25 in of rise to the bars. These risers require no relocation of instrumentation or longer cables. Optional Stainless Steel Socket Pan Head Bolts for a more finished look. The offset bar risers provide 1.25" of rise and 5/8" or 1" rearward offset. 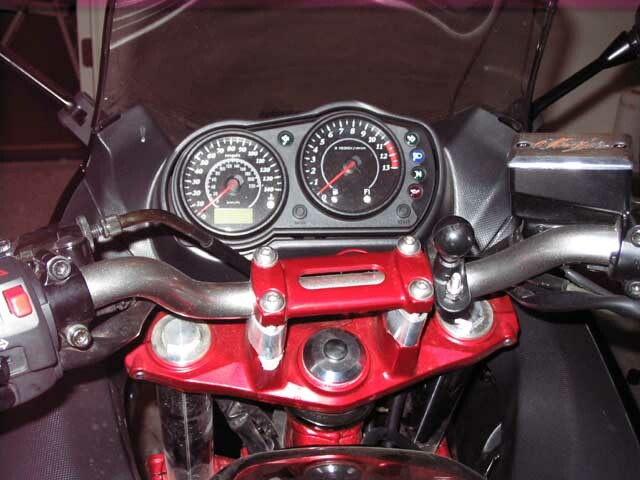 These risers are used with the offset in the rearward facing position to bring the bars back and upward to provide a more comfortable and upright riding position. Note: these bar risers will require longer brake lines and possibly throttle cables. If they are used in the rearward facing position they should not interfere with instrumentation. Have installed the risers, no wiring/hose issues at all. I just reached in and moved the tie down for a couple of wires/hoses upward a little- plenty of slack. Risers, along with carving the seat foam makes a small difference in inches, but very large difference in the comfort of a 4 hr ride for me. Perry's risers are really worth it- this much comfort for so little money and work. I like it. Its amazing how much different an inch makes. As I am used to a very upright position on my other two bikes and prior bikes, this position suits me much better, comfort, confidence, etc. I caution you that if you like the semi-sportriding seating postition, then you won't like this. Its a completely different feel on the bike. You also feel much taller on the bike. I like this, and it seems there was less wind pressure on my helmet. The lower position was bothering my arms, I felt pressure thru my arms. With the higher position, I felt some pressure just on my wrists. I will have to see how this affects me on long rides and if it will just go away as my wrists adjusts to the new position. When it feels comfortable, I enjoy riding holding just the brake side grip and sitting even more upright, and resting my left arm on my tankbag. I find that position is comfortable, and reduces wind noise and gives the sensation of less wind pressure around the middle. With the bar risers this makes this more possible and comfortable. Of course I will be chastised by some for riding with one arm but who gives a rats tail. This is strickly a resting position when I feel it is safe. Would I recommend bar risers? For me I believe yes. For some maybe no. Save the old screws in a place where you will remember where you placed them. Thanks for the bar riser site Anthony. PS: The risers do not take anything away from the overall appearance of the bike. If anything its an enhancement.